Sometimes life just hands you a cool opportunity. This is one of them. Ford Motor Company contacted me and asked if I’d like to take a Ford Mustang for a spin for a few days. I couldn’t respond “HECK YEAH!” fast enough! Let’s see… Over the course of the last decade I’ve had a Ford Explorer SUV, a Saturn Vue SUV, a Toyota Sienna minivan and now a 2015 Ford Fusion Hybrid sedan. While I still do mourn the loss of the interior space in the minivan, I didn’t miss the 19 mpg that went along with it. Right now I’m averaging about 42 mpg in my Hybrid. MUCH BETTER. Much to my husband’s dismay, I like cars. I like new cars and I like updating the car I drive every handful of years. He on the other hand would be quite content driving the same car decades past the final payment. Once I see the end of the coupon payment book I get itchy for a new set of wheels. For better or worse, I **LOVE** my current car and don’t see trading it in when the payments are up. I work from home 2-3 days a week and on the others commute 30 minutes each way to my office. My kids take the bus to school. The grocery store is 12 minutes from home. I go to the gym nearly every single day, so I get a 5 minute each way car trip. My commuter days are over so I don’t get to DRIVE all that often. But for me driving is FUN. Besides, I’ve always LOVED the Ford Mustang. This is me in 1988, the fall of my Senior year of High School in Homecoming. Every car in the “parade” was a Mustang. One of the other girls in Homecoming had a brand new 1988 model and she rode on that. Me? I had to have the vintage white 1968 Mustang. Typical. 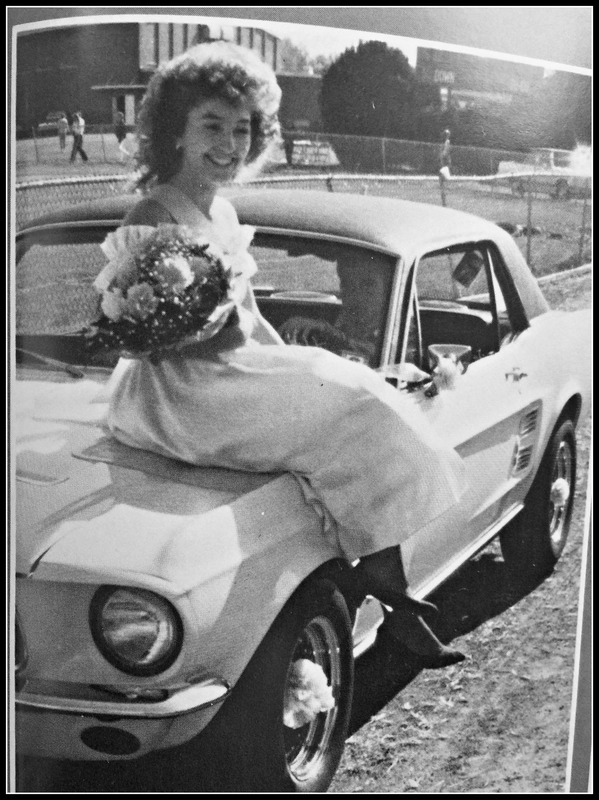 I should note our school mascot was the Mustang so that may have had a lot to do with our choice of cars. As far as the car currently on loan to me from Ford. I want it. I want to purchase one just like it. In my heart I know I’ll have to wait until my now 14 year old is driving herself and she gets my current car (heck, it’s great on gas and as a teen gas money is hard to come by.) Chances are I’ll have to wait until my now 8 year old is off in college. It doesn’t matter. Once a Mustang fan, always a Mustang fan! This. Car. Oh. My. Goodness. First off I’ll just say that I respect all traffic laws all of the time. BUT. I need to mention that is is nearly a crime to have to drive this car in a 25 mph residential zone. Luckily I live out in the boonies surrounded by thousands of acres of farms. And rarely-used paved roads. The gas mileage on this car blew me away. I’m averaging about 24 mpg but I think it would be better if I wasn’t constantly playing with the Sport Mode. There are ‘mode’ toggles that let me choose how I want to drive! I can select from different presets to adjust steering feel, throttle response (HOLY COW Sport Mode is FUN on back country roads! ), shift control, and stability control. The four modes are: Normal, Sport, Track, and Snow-Wet. I’ve used all but Track but did switch into it briefly. I think it made the car’s suspension very stiff but I’m not sure how that would translate into everyday driving. The Wet-Snow worked really well as I was nervous to drive a car that didn’t belong to me in snow!! It has Blind Spot Information System (BLIS) and a rear camera – the same as my Ford Fusion Hybrid. Seriously, I’m never driving a car without it. 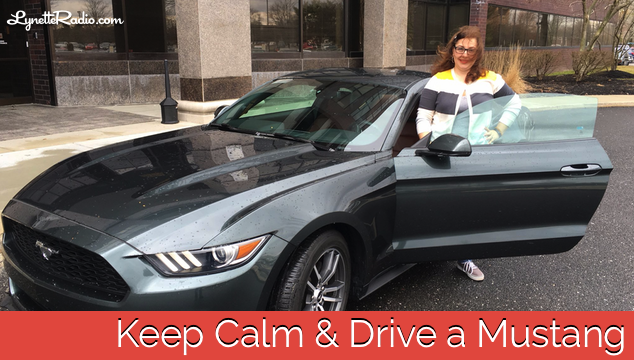 After doing a bit of research I found out that the National Highway Traffic Safety Administration awarded the 2015 Ford Mustang a five-star Overall Vehicle Score in its New Car Assessment Program. SYNC is in the car same as my car now so it was immediately familiar to me to operate. With an easy-to-access USB port on the front dash I could pop in my iPhone 6 Plus and use it for navigation with Waze. To be honest, I much prefer that over any built-in mapping system that comes with a car. Let’s be honest here. Heated and air conditioned front seats are a HUGE win. The back seats are great for putting a purse or some stuff, but not all that great for adult-sized people. It’s a sports car. I’m not expecting roomy seating for a family. My husband drives a Volkswagen Eos hardtop convertible and the back seats are marginally bigger. We didn’t buy that car for family road trips (the kids aren’t keen on driving with the top down anyhow.) With that said, my kids CAN fit in the back but my oldest is 14 and 5′ 8″ and mostly legs. The back seat is a bit rough for her so she tends to want to drive in the Mustang when it is just she can sit up front with me. Speaking of road trips, my daughter and I took a two hour drive through random country back roads last weekend blasting the stereo and it was GLORIOUS. The Mustang played my Guardians of a Galaxy Spotify soundtrack and her babymetal music like a champ.